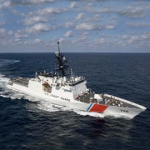 A Huntington Ingalls Industries (NYSE: HII) division has secured two contracts worth $930.9M combined to build the 10th and 11th National Security Cutters for the U.S. Coast Guard. HII’s Ingalls Shipbuilding business will develop NSC 10 under the $468.75M fixed-price-incentive contract and NSC 11 under the $462.13M contract, the company said Friday. “This additional funding for two NSCs is a great accomplishment on which to end the year,” said Brian Cuccias, president of Ingalls Shipbuilding. “These ships provide capable assets that our Coast Guard customer uses to perform essential homeland security missions, and we look forward to delivering two more quality NSCs to help with this important work,” Cuccias added. Ingalls Shipbuilding has handed over seven NSCs to USCG and is slated to commission on Jan. 19 the seventh vessel, Kimball (WMSL 756), in Hawaii. The eighth NSC, Midgett (WMSL 757), is scheduled to begin the initial series of sea trials in the first quarter of next year and the ninth ship, Stone (WMSL 758), is set to launch in 2019. Legend-class cutters, or NSCs, are intended to replace 12 Hamilton-class cutters that started operations in the 1960s and are designed to support maritime homeland security, national defense, marine safety, law enforcement and environmental protection missions. Each NSC has a flight deck for rotary-wing manned and unmanned aircraft and an aft launch and recovery component for two hull inflatable boats.